Not the most versatile speaker on the market, but great if you have an iPhone and Apple Music. Comes with access to the Beats 1 radio station from Apple. When you’ve got your music at a high volume, Siri is particularly good at hearing what is going on around it. You can’t use your voice to get the music playing from a third-party music service. 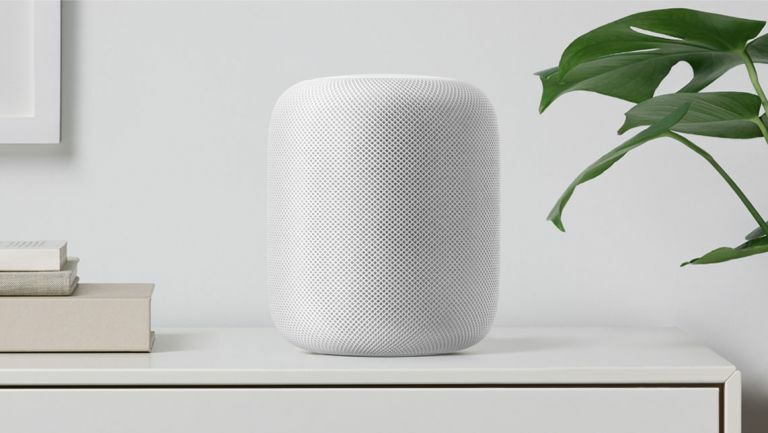 Apple was the last of the three major players in the smart speaker space to debut its own physical product, but the company has since made an impact with its HomePod speaker that offers top quality audio. It sounds better than a lot of the products sporting Google Assistant or Amazon Alexa, but what’s the smart assistant like? TechRadar's James Peckham gives us the download. Hiding inside the Apple HomePod is Siri. This is the company’s own smart assistant that we’ve seen in mobile devices since late 2011 (it debuted on the iPhone 4S) and it allows you to speak directly to your devices to interact with them in a similar way to Google Assistant. Below I'm going to run through the main features and highlights of Apple’s Siri voice assistant, but it’s worth bearing in mind most of this review will refer to the technology related to smart speakers at home. Your iPhone or iPad also includes Siri, and while we will mention that from time to time this is about how it works inside the HomePod as part of a smart speaker. All of the features you’d expect from a smart speaker are possible with Apple Siri, so you can control your smart home gadgets, get search results from the internet, play music and more on the speaker. Unlike with Amazon Alexa, there aren’t skills that you have to activate and instead all features are ready to set up and use with Siri. You can use the HomePod as a normal speaker by playing music over Apple’s AirPlay (that works in a similar way to how Bluetooth does on other speakers) from services such as Spotify or Tidal. When using AirPlay, you can then instruct Siri to change the volume, skip songs, pause or play the music. What’s frustrating is that you can’t use your voice to get the music playing from a third-party music service; for that you’ll have to use Apple Music. You can still control it when you’ve started playing something with AirPlay, but having to use a different device to get it playing is an extra step that some may find confusing. One day the HomePod and Siri may better support other music streaming services, but if you want to get home and immediately play music from your speaker using just your voice, you’ll have to sign up and use Apple Music instead. The speaker comes with access to the Beats 1 radio station from Apple, and if you own an iPhone and have the Podcasts app setup you can easily listen to your favourite shows at home by just asking the speaker to play the latest episode or start where you left off. When you’ve got the music at a high volume (and be warned, the HomePod can be very loud) Siri is particularly good at hearing what is going on around it. Often when the volume was high we found the speaker would still be able to hear our call of 'Hey Siri' to wake it. That’s something that’s not very good on other smart speakers, and it’s a highlight of Apple’s tech. Don’t be worried about having other Apple devices in the same room either. Siri on the HomePod will always take precedence over your iPhone, iPad or Apple Watch devices even if they’re sat in the same room. You may find it lights up your phone from time to time, but our testing found the speaker would always be the one to carry out any relevant requests. It’s not a feature for everyone but if you want to have a party or fill your home with music, you can own a few HomePod speakers and sync the audio so it’ll play at the same time across a variety of rooms. It’s rare you’ll use these features, but if you want multi-room audio it may be worth buying multiple HomePods. All of the other features you get on Siri on your phone are on the speaker too. That includes timers, alarms, reminders, internet searches and a way to control a variety of other devices too. It’ll even allow you to have hands free phone calls when you’re at home. You can send text messages or switch phone calls to the HomePod allowing you to have conversations even when your phone isn’t in the room. This is particularly useful if you have a HomePod in the kitchen and you’re trying to speak to someone on the phone while your hands are busy chopping and cooking. The good news is that a lot of third-party services have adopted the Apple Siri platform alongside Google Assistant and Amazon Alexa. For smart home features, Apple calls its service HomeKit and you’ll find a lot of the big smart home product developers have included Siri compatibility. You’ll use the Home app on your iPhone or iPad to set up smart devices with your HomePod, and we’ve done this for some Philips Hue light bulbs. The process was easy to follow and it worked seamlessly – like on the other two famous voice assistants – when controlling the bulbs and embracing all the features smart lighting has to offer. If you want to see a selection of products you can install with your HomePod, there’s an official list on the Apple website. It’s also worth remembering that Apple’s service is a little newer than the competition, so it may well be we see even more third-party smart home gadget makers supporting Siri in the future. Apple’s Siri isn’t the most versatile voice assistant on the market. Some third-party services work better with both Amazon Alexa and Google Assistant toting products. It’s also worth noting to set up an Apple HomePod, you’ll have to have a compatible Apple device to pair it with such as an iPhone 5S or later. You can also use an iPad Pro, iPad (5th generation), iPad Air or later, an iPad mini 2 or later, or iPod touch (6th generation) to set up the product. If you have an iPhone and an Apple Music subscription, Apple’s Siri is probably the most suitable voice assistant for you. You’ll get all the top-end audio features, and everything should work smoothly with your Apple device, too. This is a voice assistant for those who are already deeply integrated into Apple’s range of products, and it can be difficult to make the most out of it if you don’t have anything else made by Apple already. If you do though, the Apple HomePod and Siri itself are sure to offer you one of the best premium smart speaker experiences on the planet.